"Following another successful gathering of over 100 Old Scholars in 2005, the next reunion has been scheduled for Saturday 8 July 2006 - again at Dinnington Rugby Club. If you're not on the mailing list, please send sae (plus e-mail address if available) to Jon Layne, 11 Rowan Drive, Selston, Nottingham, NG16 6GL. Details will be sent out in April/May next year." 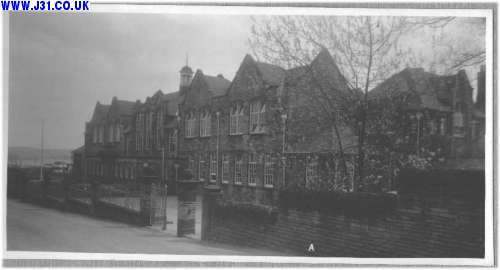 Although Woodhouse Grammar School (WGS) was outside the area now covered by www.j31.co.uk, many former pupils came from villages within it. From its opening in 1909 until the 1960's when it was absorbed into Aston Comprehensive (originally called Aston Woodhouse Comprehensive), its intake covered Aston Parish, Ulley, Wales, Kiveton, Dinnington, Treeton, Brinsworth and Catcliffe. In later years, approximately half its intake came from Sheffield City. Before indulging in personal reminiscences about WGS, it may be worth while saying something about secondary eduction in general terms. Until the early 1900's, compulsory education ended at around 11 years of age, raised eventually to 13. The only schools which offered education beyond this were the fee paying "public schools" and a few charitable foundations. In the early years of the 20th. Century, some far-sighted local authorities decided to open schools which would take pupils as far as the School Certificate and even the Higher School Certificate (roughly equivalent to today's GCSE and A-levels). One such authority was the West Riding County Council (WRCC) which covered the above villages and a new school, originally called Woodhouse Dual Secondary School, name eventually changed to Woodhouse Grammar School, opened in 1909 at the top of Furnace Lane in Woodhouse. Woodhouse in those days came under the WRCC. It was open to boys and girls. My mother, then known as Mollie Rayner was one of the first pupils and, around 1930, my sister Betty Hanson entered the School as the first pupil of "the second generation". Despite the WRCC policy, the idea of this education did not appeal to all councillors and it is reported that at the official opening, the Chairman of Governors proclaimed that he didn't hold with girls being taught in this way - "What they need is more 'eddication' at the peggy tub" (explanation for younger readers - the tub in which washing was pounded by hand before the days of washing machines). I'm not sure whether all pupils were educated free of charge at the beginning but, as time went on, there were two types of entrant. Those who did well enough at the age of eleven in the examinations held in the primary schools were given free entry; other could enter on the payment of fees. The examination was equivalent to the "eleven plus" which still exists in areas of the UK where some selection takes place but, in the WRCC, if you "passed", you were awarded the grand sounding "West Riding County Minor Scholarship". This system persisted until the late 1940's when fee paying entry was abolished; fee payers already in the School stayed there but no longer had to pay. Sometime before World War 2, Sheffield City extended its boundaries, taking in Woodhouse and with it WGS. 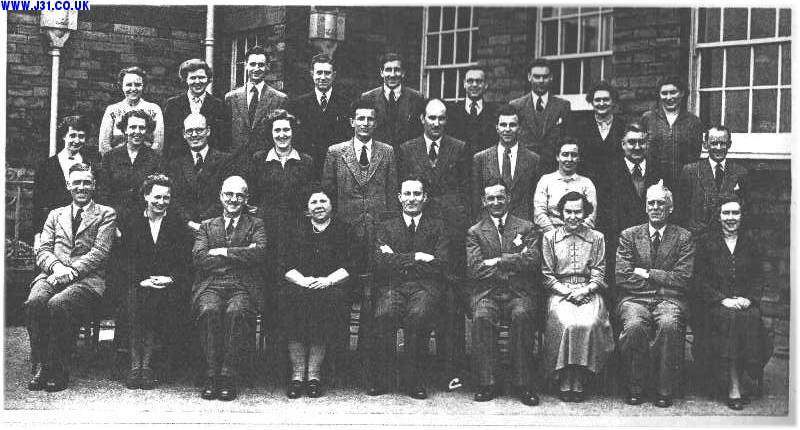 An arrangement was reached whereby the School remained a WRCC establishment but a growing percentage of its intake came from the Sheffield authority. In the late 1940's/early 1950's, Sheffield pupils were being bused across the City from Stannington. 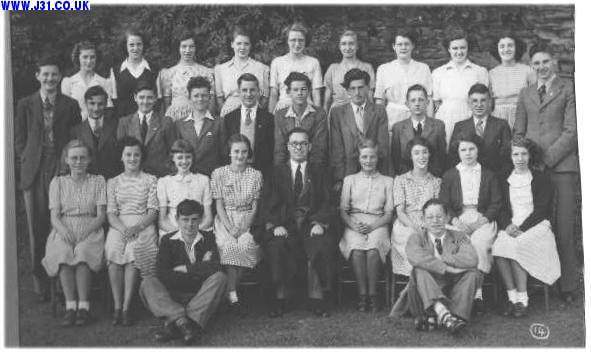 Following my sister, my brother Peter went to WGS around 1937, leaving in 1944 and I then followed in his footsteps, staying from 1946 to 1954. This prolonged period was due to my entering a year early and then being unable to take the new O-levels in the Fifth Form because, originally, the lowest age for doing so was 16. By 1946, the School had grown to around 600 pupils with a three form entry. About two thirds of the pupils in those days left at the age of 16 having taken O-levels, the rest going on to A-levels and then either work or higher education courses. The move at the age of 11 was something of an upheaval for most pupils since they were used to going to the village primary school, usually within a short walk of their homes. No more; those of us in Aston Parish travelled by service bus which was routed to drop us at the school gates. There was a return bus which picked us up there unless it was missed through detention, after school activities etc. Then it was a walk to Woodhouse Mill for another bus route or walk home up Fence Hill. Those from Wales [and Kiveton] and beyond came to Woodhouse Junction Station on the "Kivvy Train" which often seemed to us a much more exciting way of travelling - don't suppose that it was. From Treeton, Catcliffe, Brinsworth etc the transport was by private coaches - Rileys and Gordons are two names which spring to mind. Adding to the upheaval was getting used to the prefects - seventeen/eighteen year olds who seemed like giants to we young "fags". Their favourite punishment was subtractions - you were given a large number, told to multiply it by say, 39, (depending on the gravity of the offence) and then to keep on taking the original number away until you got to zero. The calculations then had to be handed in but some of us soon realised that the prefects had better things to do than to check what you had done. So, we reckoned that provided you finished with zero, no one was going to worry unless your "fiddle" was too obvious. One initiation ceremony centred around the "monkey cage" and the "crocodile cage"; these were wells around the windows of the semi basement woodwork room, surrounded by iron railings. The former was only about 18" deep but the latter, I'd guess, around 4' to 5'; certainly, it was difficult for small boys to extricate themselves from the "croc cage" without some assistance. Another change was the almost universal attendance at "school dinner" since few pupils lived near enough to go home. There was a purpose built dining hall and kitchen, presided over first by a Mrs Cleverly, then a Mrs Wood. In my time, they had a difficult job since rationing was still in force (it finally ended in 1954) and so some dishes were better than others. I can still remember "black death" (prunes and custard), "yellow peril" (apricots and custard), "frog spawn" (tapioca pudding) and "dead baby" (a jam roll about 12" long). Dinner was taken on a table of twelve with a senior pupils at the top in charge of serving and a selection of pupils down to the youngest. The latter got the dirtiest jobs (eg. scraping and stacking the plates) and also the smallest helpings. As I progressed up the School, the Headmaster, Frank Pinion, decided that mixed sittings would be a civilising influence on the boys; I realised the advantage of this system and tried to get as many girls on my table as possible since they would eat less. My record was, I recall, eight out of twelve. There were also many "out of school" activities at lunchtime and after school; running them involved the staff giving up a lot of spare time. My most vivid memories were taking part in school drama and being a member of the choir, run by Miss Gill. Memorable events of recent years have been the choir reunions which Miss Gill (now Mrs Kinman) has organised at her home in Sheffield. Meeting up with former choir members has become of the outstanding social events for many of us. I should say, however, that we're always made to sing. 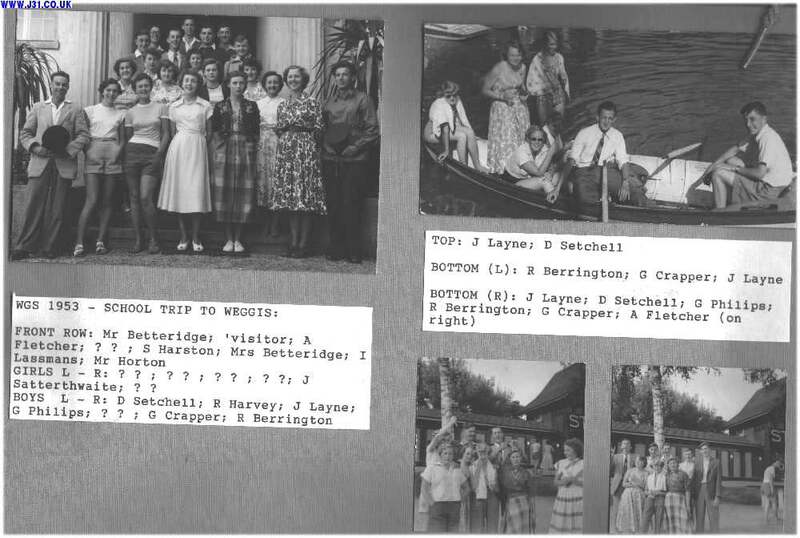 One final memory of my WGS days was my first holiday abroad with a party from the school, led by two teachers, Mr Betteridge and Mr Horton (who went on to become Lord Mayor of Sheffield. We went to Weggis on Lake Lucerne in Switzerland and, whilst there, many of us got our A-level results. Being a bit "demob happy", we sent a postcard to the Head taking the mickey out of the many words of wisdom which he had given us. 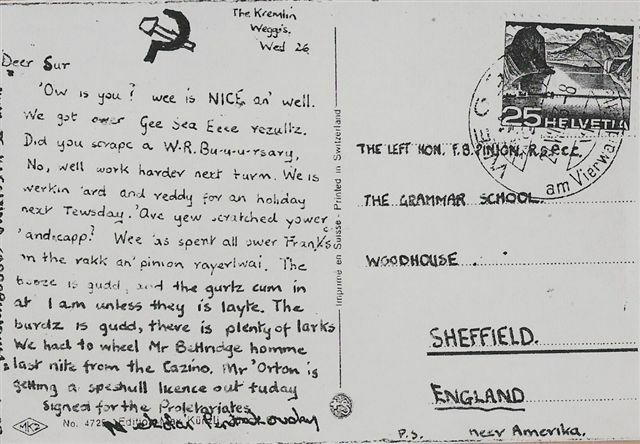 "Knowing" that teachers, especially headteachers, had no sense of humour, it was signed with a pseudonym but, over forty years later, I found out that the card was one of Frank Pinion's prized possessions and that he had just read it out at a re-union lunch of ex-WGS staff. I'm pleased to say that his daughter loaned me the card and I and Richard Harvey (from Treeton) who wrote the card to the group's dictation now have copies of it (below). Front Row: M Armstrong; W Harvey; M Radford; ? ? ; Mr Fox; M Wilkinson; D Finnegan; B Flinders; ? ?